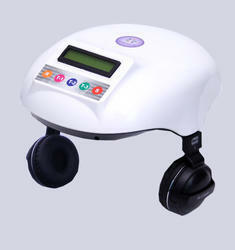 Manufacturer of a wide range of products which include low level laser therapy helmet and hair regrowth laser helmet. We offer you the scientific brilliance of the DR CURE AND CARE laser helmet, which results from years of laser hair growth technology research conducted by experts. You can now enjoy the clinical strength results of laser hair growth treatment in the privacy of your own home. In term of hair loss, hair fall, thinning, dandruff and baldness from the power of laser hair treatment.The hair grow device helmet requires no prescription, nor does it involve medication that may trigger harmful side effects with far-less powerful results. Our recommended 10 to 25 minute, once-a-day sessions feature a (5v and 3amp) power adapter operative technology to ensure hair loss treatments by laser never burden your lifestyle. It's a unisex device so man and women both can use it. DR CURE AND CARE has advnced US FDA approved technology for you as hair regrowth laser helmet. Both man and women took benefit of its uses and maintain thier hair and scalp health. Already lots of treatment available in market but this treatment you can take at doctor clinic, hospital, hair saloon, beauty parlours and your home without any side effect. Looking for Laser Hair Helmet ?